Center for Research on Christianity: ''Policeman Is Sent By God To Help'': Word Of God? 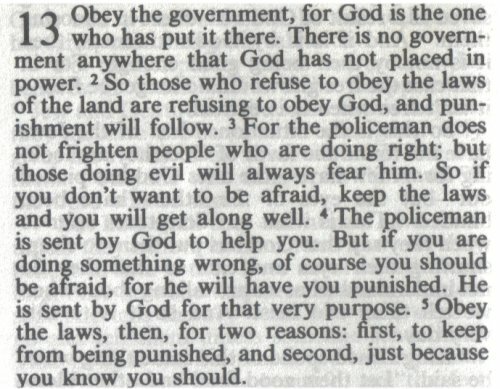 ''Policeman Is Sent By God To Help'': Word Of God? The above is a scan of the so-called "Living Bible". A scan from the 13th chapter of Paul's letter to the Romans. There are many Christians who think that this is actually what the Bible says. They trust the "translators", who themselves seem to have great trust in their intelectual (in)capabilities. What they lack is spiritual abilities. Paul never said that the policeman does not frighten people who are doing right. Or that the policeman was sent by God to help. The Greek doesn't allow such translations either. A closer study of this chapter reveals, that it's not about policemen, but about servants of Jah.